If you feel hungry after visiting Casa de La Llotja, have a meal at this restaurant. Can Paixano is recommended for the Spanish cuisine served. 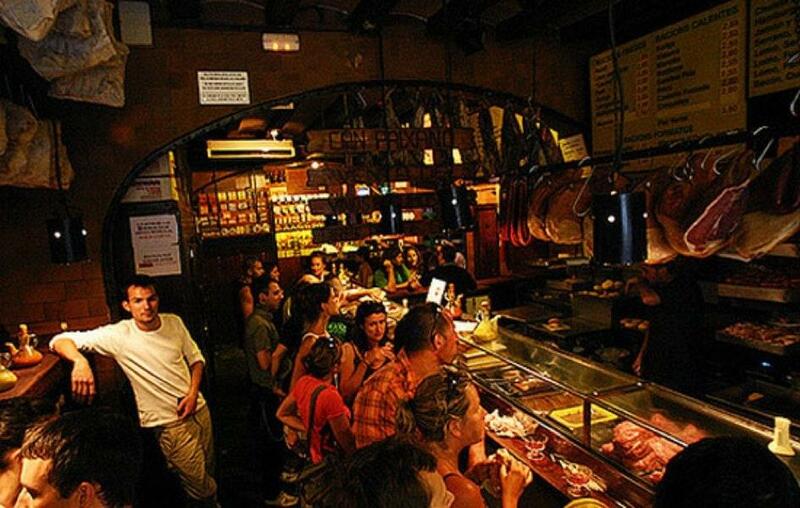 Don't forget to taste good ham sandwiches, chistorra and jamon serrano at this place. The cooks here prepare tasty pudding, queijada and cheesecakes. Enjoy delicious cava rosado, champagne or house wine. This place is known for great rose tea, white tea or espresso. This spot is well known for its great service and friendly staff, that is always ready to help you. You are to be pleasantly impressed with reasonable prices at this restaurant. The terrific decor and charming atmosphere let visitors feel relaxed here. Can Paixano has achieved 4.5 on TripAdvisor. Sausage platter was so good! But so hard to communicate in English that we only got one type instead of assorted sausage :/ The thick cut jamon was definitely not my cut of tea.... Feel like eating raw meat. And yes, you come here for Cava. Cash only! Best morcilla and sausages in general. 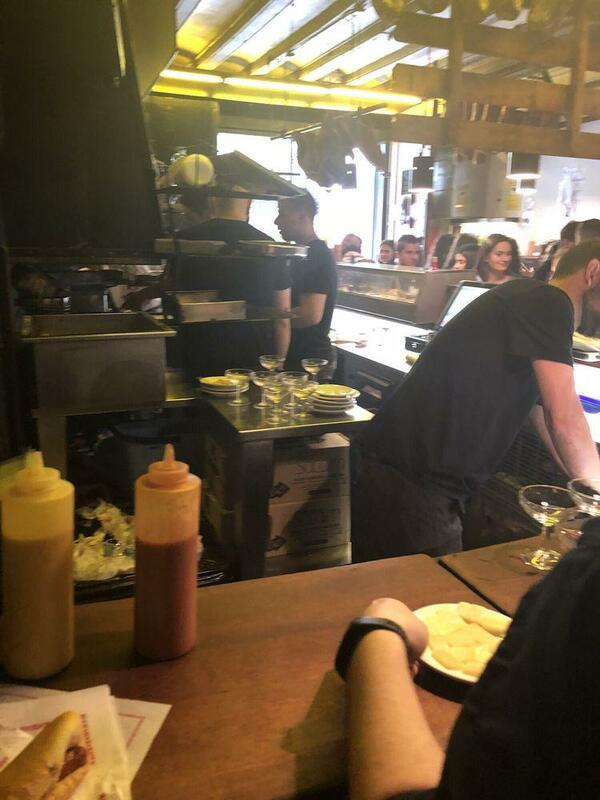 Super laidback vibe, quick service and just damn delicious food. So damn good. As we were looking for this hole-in-the-wall restaurant, we found it by noticing lots of people hanging outside drinking and eating. At first glance, everyone here had a glass of cava, also known as Spanish champagne, and sausages. There are no seats. As we approached the counter we had no idea how to interpret the menu. Speaking little Spanish, we pointed to other people's food to order and ended up with a plate of sausages and a glass of cava. I would highly recommend getting the red cava, and if you are staying there for longer, it only cost 8 euros for a bottle. The sausages were very tasty. 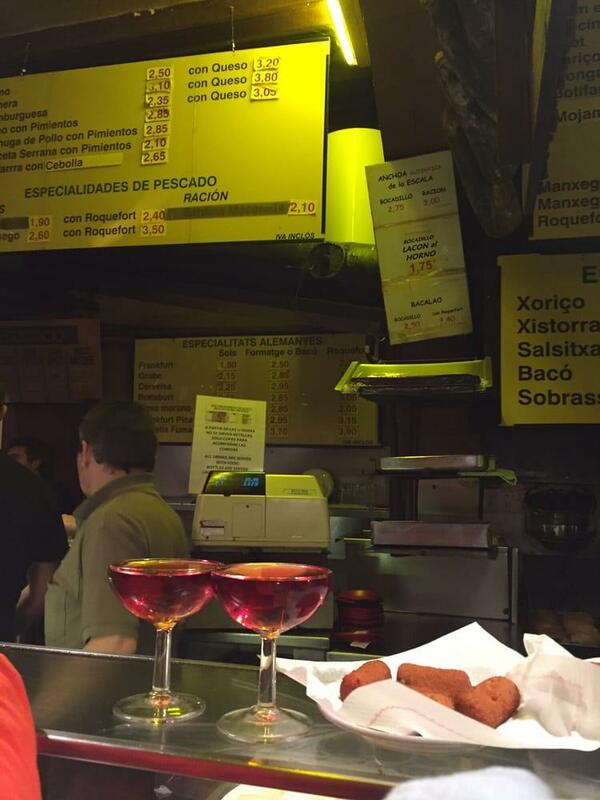 We tried the blood sausage with Catalan spices and the Xistorra sausage which was rich and savory. I also ended up trying a sandwich which was just okay. The price is ridiculously cheap. 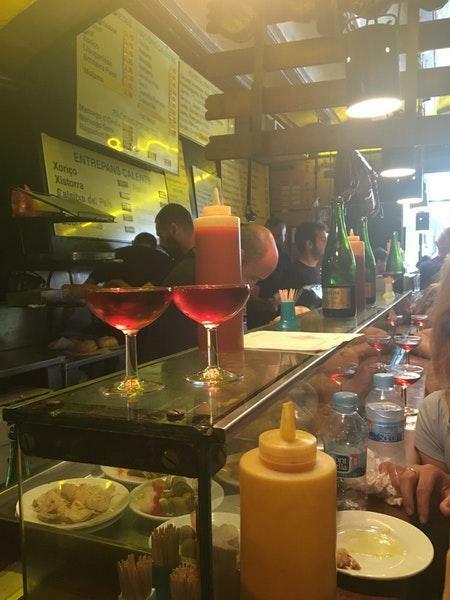 I would recommend this joint for a quick bite or to hang out while enjoying a bottle of cava along with some sausage.